Reachout is one of Connealy Reflection’s greatest sons to date. 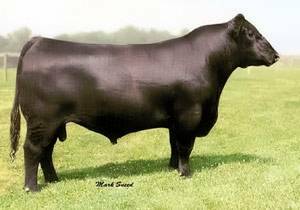 He was selected by Cherry Knoll Farms, VA, as Musgrave's top bull in 2007 after completing his first breeding season. His first calf crop ratioed 98 at birth and 102 at weaning. They are consistently thick hipped, heavily constructed, and phenotypically correct with extra length. He stems from an excellent line of Lady Barbara cows. The Reachout females are especially attractive. He sired the top-selling heifer at Musgrave's 2009 sale for $12,500, in addition to a $13,000 and $12,500 bulls.